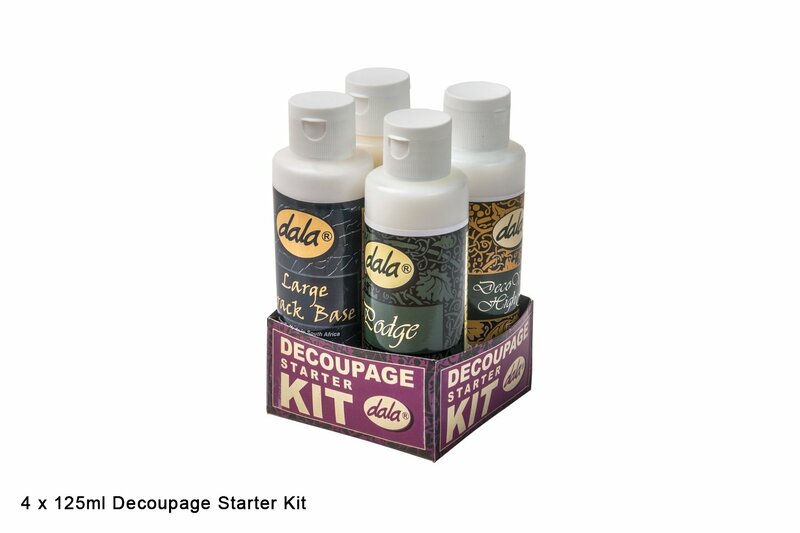 The Dala Deco Starter kit is complete with 4 bottles of decoupage medium. This kit is perfect for small decoupage projects and for those trying their hand at decoupage. As a complete kit, this Deco Starter pack has everything you need to simply create beautiful decoupage projects. Crackle Glaze - to be used in conjunction with Large crack base to create beautiful, antique crackle effects. Large Crack Base - to be used as a base coat for Crackle Glaze to create beautiful, antique crackle effects. Podge - the all in one decoupage adhesive and sealant medium. Deco Varnish - perfect for finishing off your projects with a strong top coat. This item has 1005 views.